I understand you want your child to succeed at the chosen sport you are in. You love your child and seeing them be a “winner” makes not only you happy, but they are happy as well. I get that. My kids love to win as well. I mean, don’t we all? Trophies for first place are so much nicer to show off than 4th place medals, or not even placing at all. But, what price are those trophies coming at? I understand fully how the competitive spirit happens, really. My kids are in taekwondo, and my oldest son is an apprentice belt, and my other two kids are 3 belt ranks behind, being blue belts. All have worked very hard to get where they are at in the sport, and they take it very seriously. 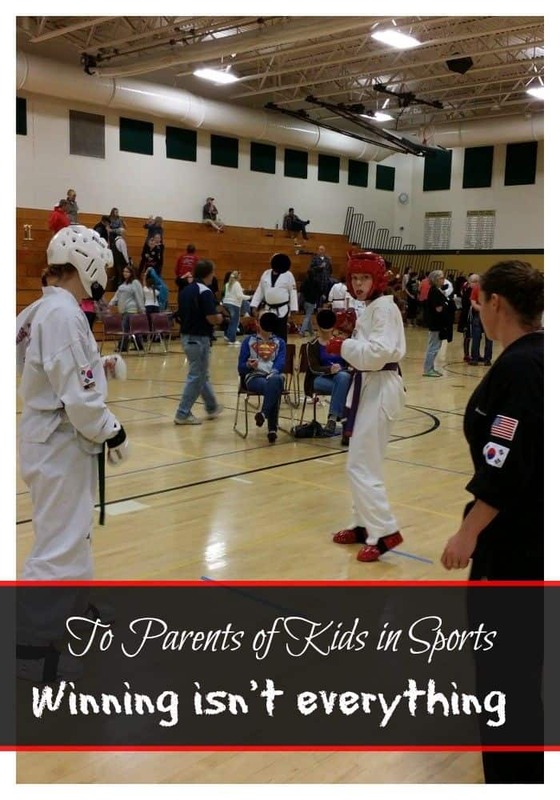 They compete with each other at home, in classes, and in their frequent tournaments. We love our tournaments, really. It’s a great way for them to showcase their skills, learn from others, and possibly take home some of those coveted trophies. To the mom of the kid my son competed with this weekend. I know your excitement was in full swing during the sparring matches. Mine was too. I saw the hopeful looks on all the kids’ faces as they waited their turn to spar with the others for that coveted first place. He stood out to me, like he stood out to others watching. He wasn’t like the other kids, more lean and quick. It looked like he was struggling to get to his feet from the floor, as he was obviously not of an ideal weight. I could see his from his rank that he had been working at this taekwondo thing for at least 6 months, and you could see the determination in his face. He stood at least 6 inches taller than your son, but must have outweighed him by at least 60 pounds. He wasn’t nearly as quick or agile as your son, that much was obvious. As the judges got ready, and the timekeeper and score keeper nodded their readiness, you began talking in a loud voice. Maybe you forgot that parents AREN’T supposed to cheer, shout, or even coach from the sidelines. Maybe your excitement got the better of you. For whatever reason, you began to shout “get him, A”, “you got this”, “he can’t move like you”. The other boy noticed your words, too. I could see it in his face as his determination waned. He got a few moves in, but your son was faster. As a matter of fact, the match ended with a score of 4-1. Of course, you were joyful in shouting that “the only point he got was bopping A on the head…he’s so big, he couldn’t move fast enough…hahahaha!”. I noticed out of the side of my eye a wheelchair by the stands. There was a larger lady, who was the spitting image of the boy your son sparred and beat. I saw the tears in her eyes as she listened to you berating her son, his size, and his ability. I felt her pain as her pride and joy in her child kept getting torn down. I could only imagine that you had no idea she could hear you, or that you didn’t really know what you were saying. I made sure to make a point to tell her that her son fought well in the match. Because, truly, he did. He gave it his best shot, and that made him a winner. He was a bigger person that I am, because he at least was out there, trying. He may have lost the match, but he was out there. Remember, that last place still beats “gave up” and that trumps “never even started”! How many times have you hear that same type of thing from other parents? This was very well written, my heart ached for the lady in the wheelchair as well as the young man. I think you did an excellent job of adressing this issue and I hope the berating mom reads this and takes it to heart.